US paid media ad spending will grow steadily in 2017, on the heels of a strong 2016 boosted by the Rio Olympics and the presidential election. A focus on mobile will fuel growth, pushing total media spend to more than $206 billion this year—a moderate increase of 6.1%. Digital spending will see double-digit growth each year of the forecast, soaring from $83.00 billion in 2017 to $129.23 billion in 2021. Digital ad expenditures surpassed TV for the first time in 2016, and the gap will widen by roughly $10 billion this year. 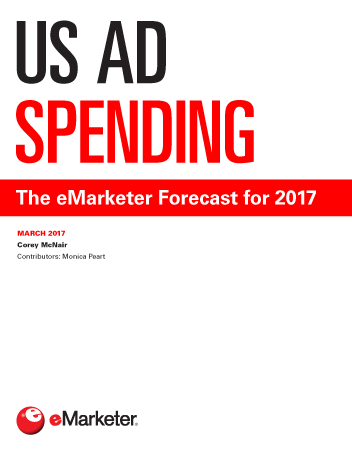 Though digital is growing, eMarketer has lowered its estimates for total media ad spending growth for the entire forecast period—primarily due to lagging spend on print. Mobile will be the main driver of digital’s growth in 2017, accounting for over 70% of digital and more than one-quarter of total media outlays. Growth will remain in double digits through the end of the forecast, with mobile ad spending expected to surpass TV in 2019. After topping search in 2016, display will continue to assert itself as the most popular digital ad format. This is due in large part to the popularity of rich media—which includes social ads on mobile devices—and video. While TV will command a strong $72.72 billion in ad spending this year, increases will be sluggish through 2021, hovering between 2.0% and 2.5% each year. As ad dollars are further allocated to digital, TV’s share of total spend will decline from 35.2% in 2017 to 30.8% by 2021. Over-the-air radio and out-of-home (OOH) advertising will also see small increases during the forecast. Radio will grow 0.2% in 2017, while OOH is still seeing growth from the digitization of billboards and will rise 2.0%. Meanwhile, print media will continue its downward trajectory, with magazines slipping 2.0% and newspapers down 5.0%. "Digital made up 36.7% of total media ad spending in 2016 and will account for around half by 2021. Mobile will be the main driver of this growth, comprising 70.3% of digital spend in 2017."